ABOUT: Zen Society is a 100% natural and organic company based out of Stamford, CT and was founded by Kaitlyn Lockman, a master herbalist and board certified holistic health practitioner. The line offers fresh, handcrafted skincare products using the highest quality organic ingredients from USDA certified suppliers in the New England area. 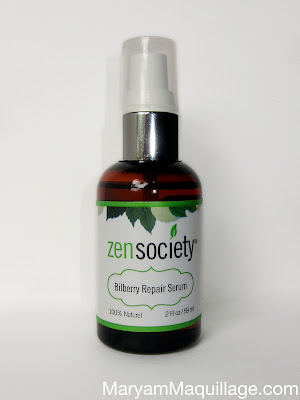 There are absolutely no preservatives, toxins, or other chemicals in the Zen Society skincare line, which makes the products ideal for even the most sensitive skin. The company operates with very high environmental awareness and a percent of every sale is donated to Friends of the Earth to help sustain a healthy planet and a just world. 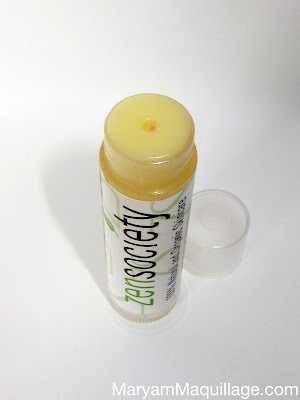 I was first introduced to Zen Society through the Green Your Beauty Routine blogger event I attended last month, and was positively shocked by the quality of its Peppermint Lip Balm, which was included in the goody bag for the guests. I was so impressed, I even tweeted about it and within a few days, I received a couple more items to review! No doubt, this is the best lip balm I have ever used and it sparked my interest in Zen Society. The rich emollient blend of oils (sunflower oil, coconut oil, and peppermint essential oil in the Peppermint flavor) soothes, smooths and protects the lips from drying and chapping. This balm is the smoothest lip product I've tried and does not contain any petroleum or synthetic flavoring. Plus, it lasts all day long -- no need to reapply! The Spearmint and Pomegranate balm flavors are 100% vegan and use Carnauba Wax, a natural vegetable wax found on the leaves of a palm tree. Organic aromatic essential oils are used to add a pleasant fragrance and long lasting taste. These balms make a great gift and I'm planning on getting myself a couple -- one in each flavor! Infused with organic sweet almond and hemp seed oil, this makeup remover works as well, if not better, than my trusty Neutrogena; except this product contains 100% USDA certified organic ingredients, meaning that it is 100% better for your skin and for the environment. The product feels and smells like vegetable oil, and though it leaves a slightly greasy residue after use, it penetrates quickly and results in silky smooth lids and lashes in the morning. Side Note: I've been using this product for almost a month and I was surprised to discover my lashes appearing denser and longer. Little did I know that Sweet Almond and Hemp (the key ingredients in this product) are actually hair growth stimulants -- so I'm not dreaming -- my lashes are actually growing and I couldn't be more thrilled! I'll take it, because my little Asian soldiers need all the help they can get! This lightweight facial oil is packed with seven essential oils derived from flowers, fruit and plant botanicals. Bilberry and Red Raspberry are naturally rich in antioxidants that help protect the body from free radicals - naturally occurring particles associated with accelerated aging. Bilberry and Castor Oil also help strengthen the blood vessels to combat dark circles and improve the appearance of age spots and sun damage. The benefit of using oil on the face has almost become a known fact. As most mainstream cosmetic products strip the natural oils out of the face, the glands react by producing more oil, making the skin more oily and acne prone. Although I had known this all along, I was still a wee bit hesitant to use this product given that my skin is naturally very oily. With that said, I was prepared to take the leap for the sake of the review and as advised, I started off by gradually adding the serum to my daily moisturizer. RESULTS: I noticed immediate results in the first week of using the serum. My skin felt lifted and tighter in the areas where I used the product: forehead, smile lines, and eye area. Surprisingly -- though, as expected -- these areas did not break out in acne pimples like I had thought they would, so by week 2, I was using the product alone. I didn't see any visible changes in my skin, but then again, I'm in my twenties, and I don't have any wrinkles just yet. What I did notice was that my skin was feeling and looking great even though I had been abusing it with constant makeup changes and lack of sleep due to the events of the month. Having said that, I credit this product with helping to save my skin during a period when I needed it most. Overall, I highly recommend this serum to anyone in their mid-twenties as a starter product for age prevention. Around the eyes (crow's feet) -- typical wrinkle area for people of Asian descent. Between the eyebrows and forehead -- I store a lot of my tension in my brows, so this is an area I pay close attention to. Zen Society is vegan, cruelty-free and Green, offering 100% natural, organic skincare products for the face and body. 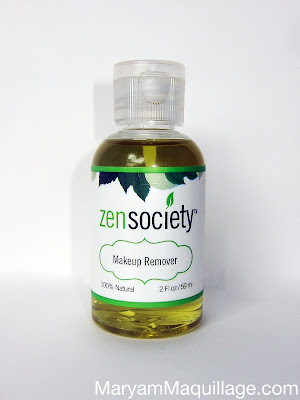 Zen Society uses only USDA certified organic ingredients and starch-based biodegradable or recyclable packaging. I am extremely happy to have found and featured this local company that operates with high environmental awareness and social responsibility. Please, help our world be more Green and support Green businesses like Zen Society. I'm really happy many companies are now vegan and cruelty free. I wish they all were. I'm a veggie and I wish my fav brands were cf. Your skin looks very healthy, i love the fact that these products are affordable. One thing i love this product is it uses organic ingredients. I am sucker of this type of product. I will gonna find this one at Watson. On the other hand, What most people don’t known is that there are a number of chemicals that are not stated in the labelling, and these could be harmful in the long run. I’m really amazed with your posting skills as well as with the layout on your blog site. Is this a paid style or did you modify it yourself? Either way keep up the pleasant quality writing, it is rare to see a great site such as this one these days.I recently came to know about www.avanaaustralia.com, their Organic Skincare products are very effective.